(Nanowerk Spotlight) Miniaturizing traditional laboratory assays to automated lab-on-a-chip devices holds tremendous potential for enabling multiplex, efficient, cost-effective and accurate pathogen sensing systems for both security and medical applications. These sensors could be used to detect bacteria such as E. coli and Salmonella, but also other pathogens that could be used for bioterrorism. Traditional identification methods required time intensive cell culturing processes but novel pathogen sensors based on nanomaterials are promising vastly improved and speedy detection technologies. "First, peptide nanotubes can incorporate any antibodies for viruses without losing the recognition function so that targeted viruses are selectively trapped on the peptide nanotube surfaces with strong affinity" Hiroshi Matsui tells Nanowerk. "Second, the shape and the dimension of peptide nanotubes are ideal to detect the binding event with viruses because they match the electric field line distribution between a pair of electrodes, which maximizes the impedance signal from the virus binding to accomplish the low detection limit of viruses. Third, these dielectric peptide nanotubes can be aligned between electrodes via dielectrophoresis easily to adapt flexible designs of virus sensing probes on the chips. These features make the peptide nanotube-based lab-on-chip platform an exceptionally sensitive sensor." Matsui, a professor of bionanotechnology at Hunter College in New York and Roberto de la Rica, a postdoctoral fellow in Matsui's group, together with collaborators from the Nanobiosensors and Molecular Nanobiophysics Group at the Research Center on Nanoscience and Nanotechnology at Universitat Autònoma de Barcelona in Spain, have examined the feasibility of assembling peptide-nanotube sensors with a simple chip geometry for electrical virus detection. They reported their findings in the November 6, 2008 online edition of Angewandte Chemie International ("Label-Free Pathogen Detection with Sensor Chips Assembled from Peptide Nanotubes"). The on-chip pathogen-sensing platform developed by Matsui and his team consists of a pair of electrodes separated by a micrometric gap that is bridged by peptide nanotubes. 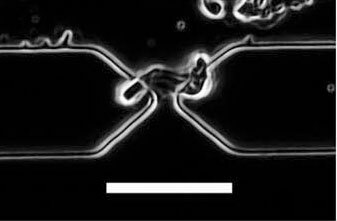 Using this configuration, the scientists were able to detect the binding event between a virus in the sample and its antibody on the peptide nanotube by a capacitance change between the electrodes. Matsui points out that capacitance and impedance measurements were used previously to detect micron-sized cells, and it was also demonstrated that a nanoscale capacitance probe could be used to characterize the composition of polymers and semiconductors. "However, capacitance measurements have not yet been used extensively in the development of pathogen nanosensors" he says. "Typically, a direct-current (DC) conductive probe has been used to detect small biological molecules and viruses on semiconductor nanowire-bridged sensing platforms. However, in our study we applied an alternating-current (AC) capacitance probe for virus detection owing to the nonconductive nature of the nanotubes." With the AC probe, the contact between the peptide nanotube and the electrodes is not as influential to the signal as with the conventional DC conductive probe and therefore the accuracy of detection was expected to be higher. Matsui's team prepared their peptide nanotubes by self-assembly from bolaamphiphilic peptide monomers and then coated them with antibodies. Using positive dielectrophoresis, they then assembled them on the chip platform by directing them to the gap between a pair of electrodes. "Pathogen detection in our sensor device configuration takes advantage of the difference in the dielectric properties of viral particles and water molecules" says Matsui. "It is well established that viral particles have lower dielectric constants than water, in accordance with their coreshell structure. Hence, the binding of viruses to the peptide nanotubes is expected to decrease the permittivity of the medium surrounding the nanotube and consequently decrease the capacitance between the electrodes." The researchers were able to detect the binding of nanoscale viral particles to the nanotube on the basis of the capacitance change, as the peptide nanotube was placed at the gap between the electrodes where the path of the currents was shortest and the electric field was strongest. Matsui explains that in their device configuration, the major role of the nanotubes is to concentrate targeted viruses selectively by molecular recognition at this location: "At this position, impedimetric detection with the electrodes is most sensitive. The very good match between the dimensions of the peptide nanotubes and the electric-field line distribution enhances the capacitance signals." This peptide nanotube chip can be easily scaled up by increasing the number of nanotubes and electrodes on the chip, thus enabling the multiplexed detection of viruses as peptide nanotubes coated by multiple antibodies are registered on the array platform. Matsui cautions that this is a challenging task with regard to the registering issue for the interface of a large number of electrodes. Nevertheless, it is feasible and could make for a practical chip sensor design.